It was all crystal clear, wasn’t it? We were going to get whopped. Ah well, at least we’d have a pleasant few days in Paris with no anxious nail-biting, because, well, it wasn’t going to be close, was it? And in the end, it wasn’t! Thomas’s picks delivered a whopping 9.5 points and US captain Jim Furyk’s a mere 2 points, both courtesy of his final pick, the multi-talented Tony Finau. Shows you what I know! A wonderful setting for the closing holes, bathed in sunshine all week. Europe combined to make the perfect team, the whole being so so much more than the sum of the individual parts. That’s the bit the Americans don’t quite get. At the top level in team golf nowadays you cannot afford to have any of the undercurrents of blame and discontent rumbling through the team. The dissolution of the hitherto successful partnership of Patrick Reed and Jordan Spieth was obviously not handled as well as it could have been by Furyk because Reed was still aggrieved by it at the end of the week. And what on earth was Reed’s wife thinking of – getting involved in twitter conversations re the split? Heaven forbid that that would ever happen on a European side. The sights and sounds of a Ryder Cup are extraordinary. We see players in their work place in a way we never normally see them. Quiet, understated, unflappable folk like Francesco Molinari turn into magnums of shaken champagne erupting into unconfined joy at the acquisition of another precious point. When he gets time to look back at the TV pictures he’ll wonder was that really him? How fitting that the honour of clinching the Cup and becoming the first European player to win five points out of five should fall to Molinari. His fellow Italians must be rubbing their hands in delighted expectation of hosting the next home match in 2022. It’s not just the players that are different, the crowds are too. It’s not uncommon to see all manner of fancy dress and always something to bring a smile to your face. Birdies of a different sort on show. Not all fans dressed in red were behind the US. Finally, the behaviour of these crowds is also different and, to be honest, it is something I struggled with a little bit. At one point when an American shot found water to loud European cheers, Patricia turned to me and said, “Dad wouldn’t like that.” And no, he most certainly wouldn’t. We were definitely brought up not to celebrate an opponent’s mistake or misfortune and to be respectful and fair at all times. So, why was I enjoying it so much and, whisper it quietly, even doing my own share of cheering? Patricia felt it was because it was akin to cheering when your opposing footie team missed a penalty. It is in a way, but I don’t like any comparison to football. Claude Harmon summed it up perfectly for me. 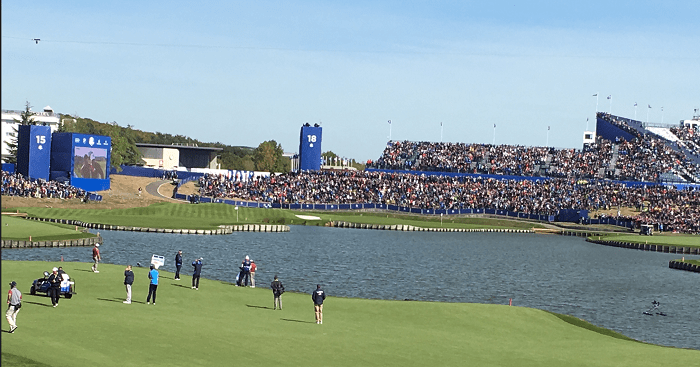 The Ryder Cup is no longer simply a great golf event, it is one of the world’s greatest sporting events and as such, there are many many sports fans present who are not necessarily golfers. The crowd was so involved in the matches and so partisan and that all contributed to a stunning atmosphere and one that every player on each side relished. Not once did I hear an unkind remark aimed at any of the opposing players (unlike two years ago in Hazeltine), and not once was there anything but respectful silence when the Americans were playing. Two years ago there was an unpalatable edge to a section of the crowd’s behaviour because alcohol was on sale from 7am when the gates opened. This small but vocal number of boozed-up fans were a disgrace and an embarrassment to our gracious hosts. There was absolutely none of that in Paris. So, sorry Dad, I am OK with the cheering of the US water-bound shots and their missed putts. 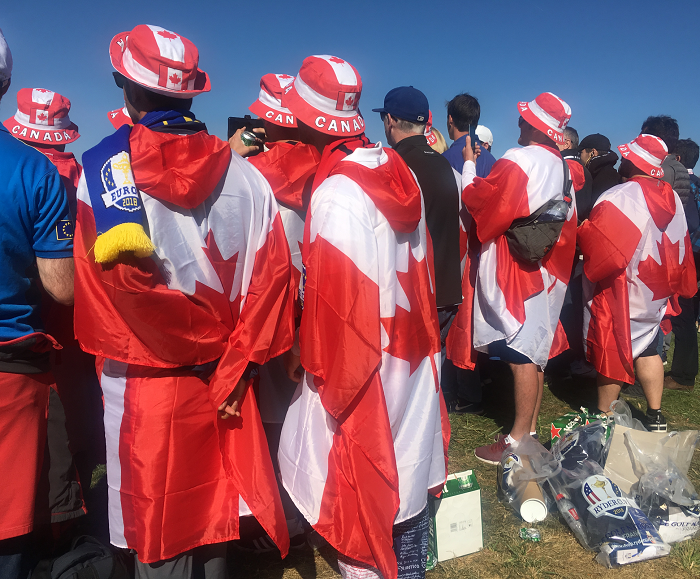 The involvement of the fans is part of the whole experience of the current-day Ryder Cup as long as it is good natured and no American player had any criticism to make. When Patrick Reed holed the winning putt in his singles match he turned to the crowd and held his finger to his lips, returning the shushing gestures he had received from them as he walked up onto the green. He then dropped his club on the ground and applauded the galleries and the part they had played in supporting their team. It was a nice moment. So, well done Thomas Bjorn and the European team. The captain’s picks were pivotal. Sure, I knew all along we’d win!! Tired but happy! Our boys did it! In all the euphoria of Paris and Europe’s majestic mangling of the supposedly all-conquering United States Ryder Cup team, it’s easy to forget that it all looked pretty bloody awful near the end of the first morning. We were 3-nil down and Tommy Fleetwood and Francesco Molinari were two down after 10 against Tiger Woods and Patrick Reed. The Anglo-Italian combo birdied 11 and 12 to square the match and it was still level after 14 holes but thoughts of a depressing, Cup-over-before-it-began series wipeout started creeping in. Sitting near the top of the stand on the 18th, giving my jaw a workout with an overpriced but well-filled baguette, I was feeling a bit gloomy, not helped by the sight of Fleetwood’s second shot to the fearsome 15th apparently heading towards the water. Somehow it hung on to the edge of the green – collective will perhaps – and Fleetwood changed everything when he holed the putt for a birdie three. He went wild, hair flying, fist pumping so hard you feared his momentum might take him into the water across the green. The crowd went from subdued to super-charged in one glorious, mad moment and that was the end of subdued for the duration. Sue Spencer (front, 3rd from right) with her adoring fans in Somerset. Strictly no crowd surfing. Fleetwood did the same again, more or less, at the 16th and when Molinari birdied the 17th, Woods and Reed found themselves shaking hands, defeated, deflated and, more than likely, bemused. The Americans never recovered and the Europeans never looked back. It was intoxicating. It was noisy and there was unashamed cheering whenever the Americans missed a putt and put a ball in the water but out on the course, it didn’t seem wrong, it seemed spot on, gladiatorial, partisan but not vicious or nasty. I agree it isn’t for the purist but the Ryder Cup isn’t golf as usual – apart from, mostly, impeccable silence whenever a player is playing a shot; it’s golf off the leash, golf’s Cup Final, Six Nations, whatever compelling, no-quarter-asked-or-given sporting contest you can think of. The players give their all, pouring their heart and soul into the endeavour and so do the spectators. No wonder we’re all shattered at the end. I know people who celebrated, cavorting on the 18th green, partying into the night and no doubt eating cake at Versailles and were still well enough to take selfies with Molinari at the Gare du Nord the next day. That wasn’t Maureen and me. Packed into the shuttle bus to the station for one last time (hooray), there was no chanting, no oleing, no celebrating. You’d have thought we’d lost, so quiet were we, unsmiling, concentrating grimly on remaining upright as the bus lurched along its route. We, too, had given our all and, like Tiger, had run out of gas. Wales captain Vicki Thomas keeping the dragons flying. Thomas Bjorn didn’t have to drive his own buggy. If you’re thinking of going to a Ryder Cup as a punter sans privileges, prepare as though you’re going to walk in the Himalayas because you’ll undoubtedly face a route march before you even reach the golf course; and pack your own food or empty your bank account. I paid 5 Euro for a white Magnum out on the golf course – you must really have wanted that Magnum a friend said – but I made sure I enjoyed it. The organisers were lucky it didn’t rain – wet punters disgruntle much more quickly than dry ones – and, of course, winning puts a gloss on everything. It would be nice to slump in a heap for a week or two, absorbing it all, sorting through the memories – that fist bump with Fooch, that wave from Rory, that chat with Justin Thomas’s college friends – and soaking the aching feet. It was worth another early start on Wednesday just to visit the chiropodist. Laura Webb leads off for Ireland. 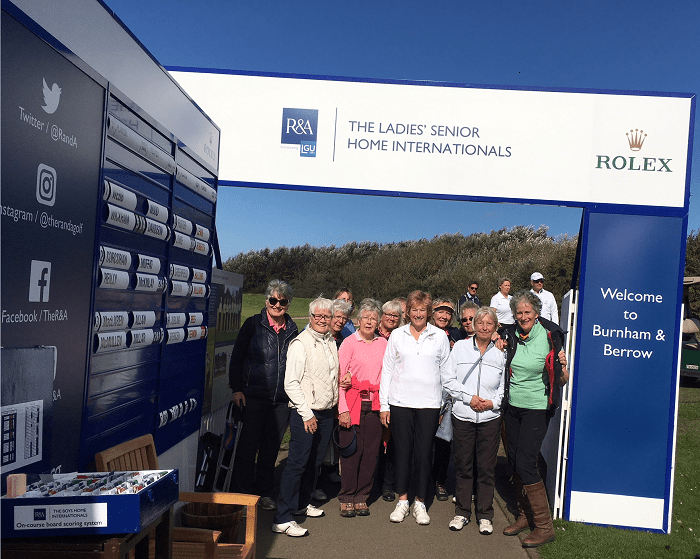 And yesterday the alarm went off again at some ungodly hour, not quite of Paris proportions but early enough because I had to be at the golf club by 0700 to leave for Burnham & Berrow for the last day of the Women’s Senior Home Internationals. Ten of us, led and driven by the redoubtable Susan Sims in a tatty, rented minibus – it looked ok in the dark but as the day got brighter and we started to take an interest in our surroundings, it became apparent that whoever had cleaned the inside must have done so in the dark without any real idea of what the task involved. Whatever. We reached Somerset safely and my spirits soared when I saw the golf course again – a lovely links, a proper course, all humps and hollows, under a brilliant blue sky. 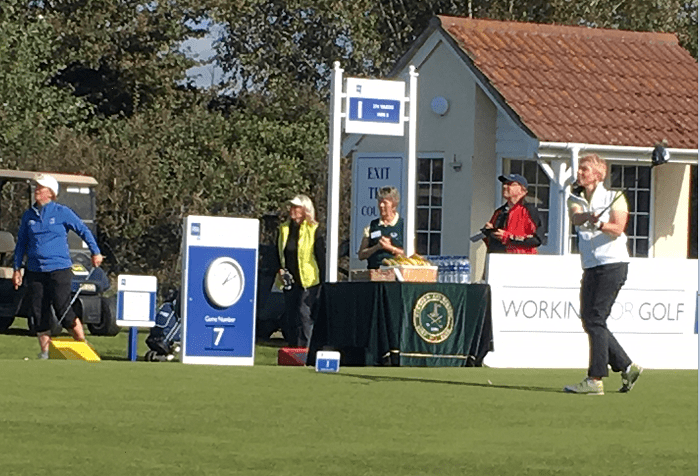 We were there to support Whittington Heath’s super senior Sue Spencer – Spenny – who was playing in her first home international series for England, a daunting prospect as well as an exciting one. 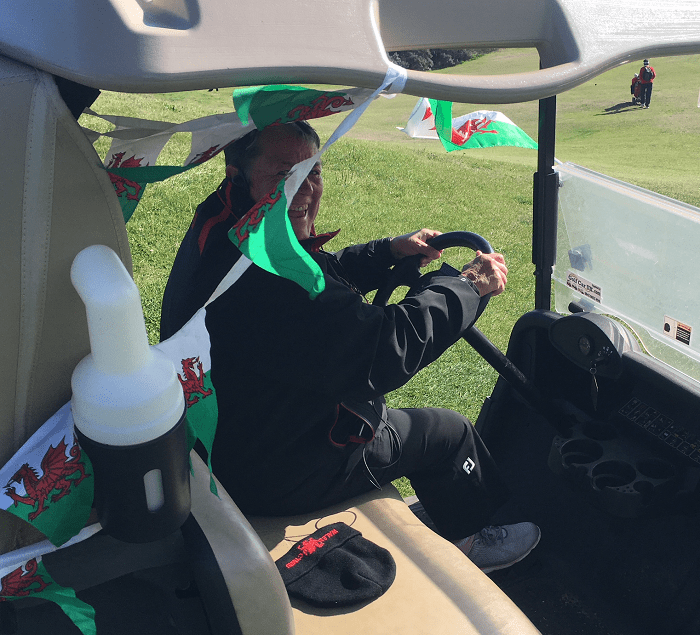 B & B is a glorious old-fashioned course – you go all the way out and come all the way back – and by the time I’d bought a sandwich and a pair of socks (having left mine neatly laid out at home), Spenny and co were well away. I caught up with them at the 8th, the very far end of the course by which time I was in my shirt sleeves, topping up my vitamin D levels. It was a joy to be there. 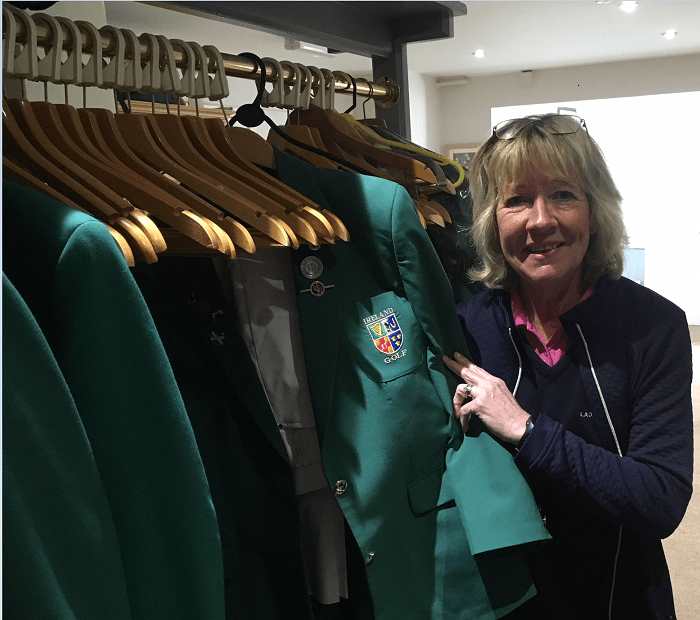 WHGC captain Karen Crarer, an Englishwoman, admires the winning team’s green jackets. 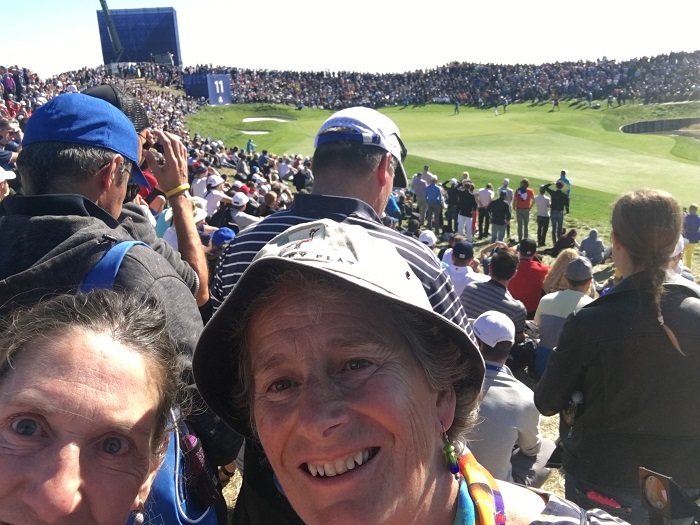 Spenny and her partner Karen Jobling, a member of Richmond in Yorkshire, who has also played cricket for England, lost on the 16th to the Welsh pair of Jane Rees (Minchinhampton) and Patricia Fernon (St Pierre) but it was to be Wales’s only point of the final day. Still, England, I am happy to report, finished second behind Ireland, with Scotland third. It was a close-run thing, with all three teams recording two wins but Ireland, the defending champions, captained by the ageless Valerie Hassett, won just enough games to retain the title. Hooray. Next year’s matches are at Co Sligo Golf Club, Rosses Point, which was where Dad grew up and was always his little bit of heaven on earth.